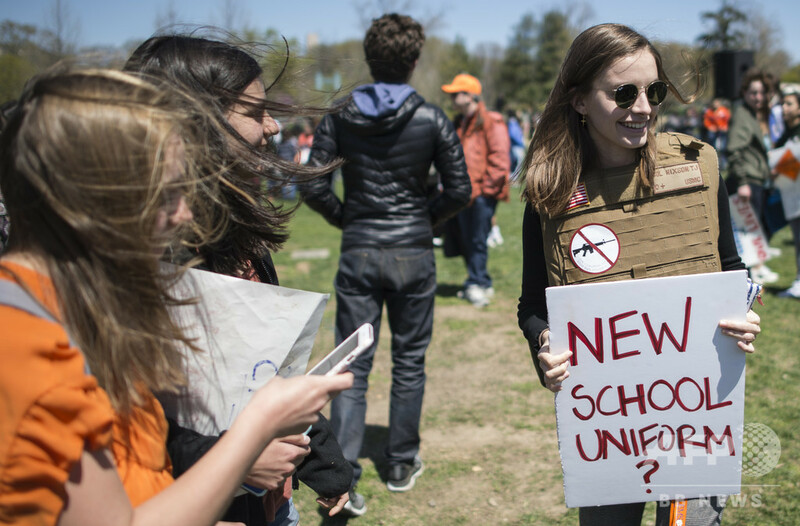 Yorktown High School junior Zoe Coutlakis holds a sign on the West Lawn of the US Capitol after rallying with several hundred fellow students to call for stricter gun laws in Washington, DC on April 20, 2018 to protest gun violence. Students across the US were urged to walk out of classes to mark the 19th anniversary of the 1999 school shooting at Columbine High School in Colorado which left 13 people dead. The walkout has been organized by students at Marjory Stoneman Douglas High School in Parkland, Florida, where 14 students and three adult staff members were killed by a troubled former classmate on February 14, 2018.